In our cleaning guide, we recommend against using steel wool to scrub stainless steel pans. The problem is that bits of the steel wool filaments can get embedded in the cookware stainless steel and promote rust. However, we discovered a new scrubbing pad recently made of stainless steel, the Scotch-Brite stainless steel scrubbing pads. 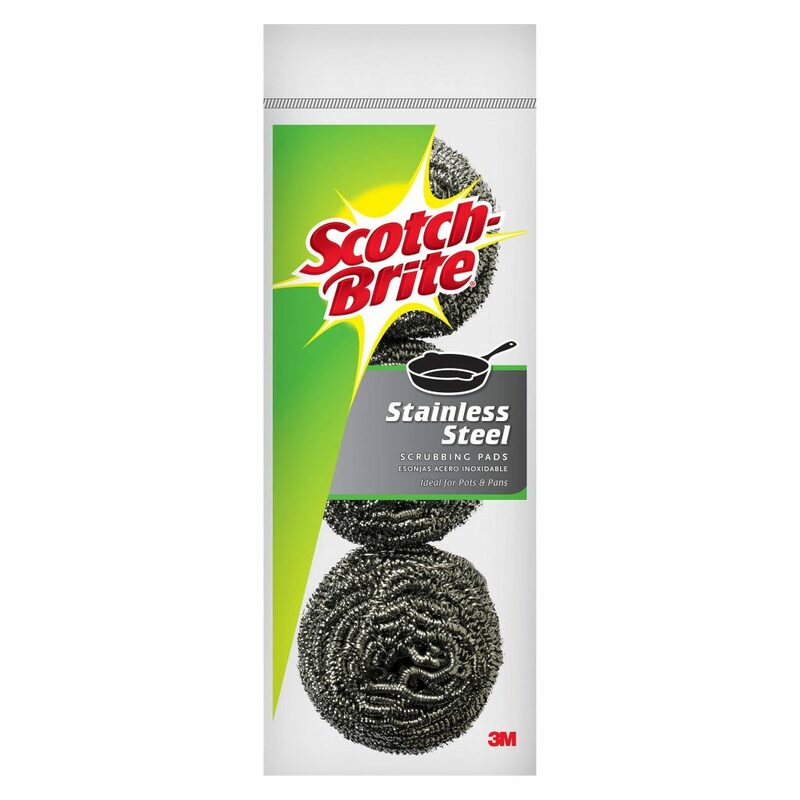 Scotch-Brite green scrubbers are our favorite tools for cleaning the inside of stainless steel pans, as they can easily remove food and hard water buildup, and leave the inside with a nice dull polish, (which it will end up with from metal utensils anyways). The stainless steel scrubbers look useful for dealing with the harder burnt on crud. As a reminder, never use an abrasive scrubber (either of the two above) on the outside of a stainless steel pan, as it will dull the finish. To clean the outside, use a nylon scrubber to clean and Bar Keepers Friend to polish (as well as a good copper cleaner to polish the copper bottom). If you have burnt on food on the outside of the pan, use one of the techniques in our cleaning guide to get it off without harsh scrubbers. I have acquired a vintage Revere Ware pan that has fairly deep swirl marks in the inside of the pan that appear to have been made by steel wool of a large grade that should not have been used on the pan. Any suggestions on how to repair/smooth out those scratches? Should I just use a finer grade of steel wool on the pan? Steel wool will rust, and when you use it on stainless steel, little bits of the steel wool get lodged in the stainless steel and promote rusting. So, never use steel wool on stainless steel cookware. I would scrub the inside with a green Scotch Brite pad, and then follow it up with a good polishing with Bar Keepers Friend. The combination of the two should hopefully ease the swirl marks and get rid of any remaining steel wool remnants.